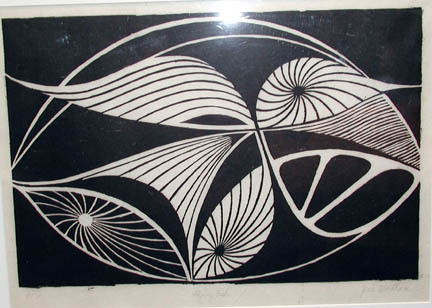 Woodham is internationally recognized for oversized sculptures with fluid lines. Her work is in many public and private collections, including those of General Electric, the Atomic Energy Commission, and the World Bank. Also a printmaker, she received a Westport Lifetime Achievement Award in Visual Arts in 1999. Jean Woodham’s distinctive large-scale sculptures occupy important spaces all over the country. Unlike much of today’s art, her work is not about politics, violence or despair. It is about life and possibilities. With contagious enthusiasm, she continues to redefine the terrain of modern sculpture. Woodham moved to CT in 1955 and directed the sculpture program at the Silvermine Guild of Arts, the nation’s largest artists’ cooperative. She is one of the first artists, male or female to use welding and industrial know-how to creat huge outdoor sculptures - and to date, over 150 of her sculpture have made their way into public and private collections. Among them: Progression, commissioned by the US Atomic Energy Agency, architectural-scale commissions created for General Electric, NYNEX, the CT commission of the Arts, the World Bank and Scholar’s Sphere, a 3 story high, five-ton installation outside a New York City High School. She has maintained a home and studio in Westport since 1970. Woodham, Jean, “Flying Fish ,” Westport Public Schools Digital Collections, accessed April 23, 2019, https://collections.westportps.org/items/show/497.